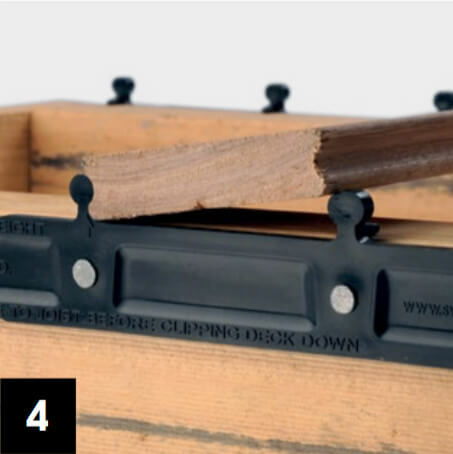 The SWIFTDECK process consists of a SWIFTDECK Clip that fixes to the side of deck joists, Polyurethane Adhesive, and pre-grooved SWIFTDECK decking boards. 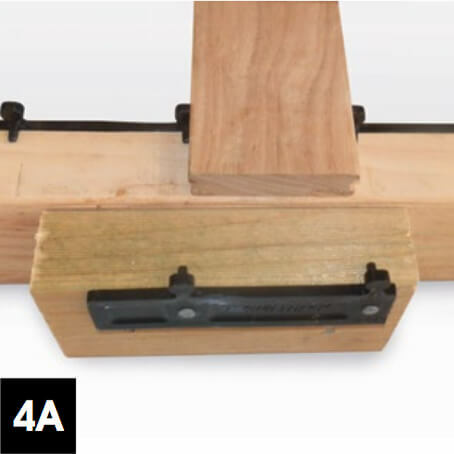 Before commencing installation, it is important to note that joists must sit on top of bearers, or have at least 35mm on one face free to allow fitting of SWIFTDECK Clips. 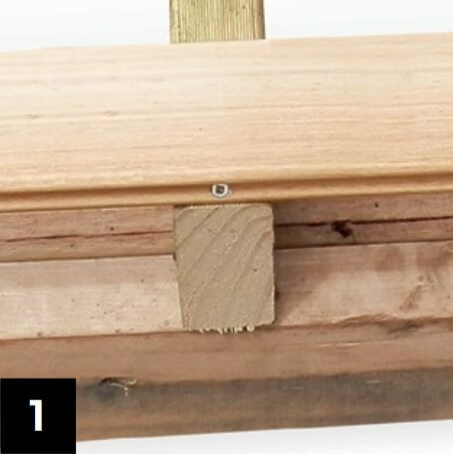 Secure the first edge board of the deck using conventional fixings, or ‘secret nailing/screwing’ in the rebate in side of board, ensuring straightness – as all other boards will follow this set out. (clip groove only on 1 side) are available. Locate SWIFTDECK cliprail into the groove of the first fixed board and fix cliprail to the joist. (using clouts, nail gun or screws). Make sure all the lugs on the cliprail are touching the top of the joist. If joist is a little twisted, fit to high side. Having first ensured the joists are clean, place a wide bead of flexible polyurethane adhesive on top of the joist between the clips for up to 5 boards at a time. 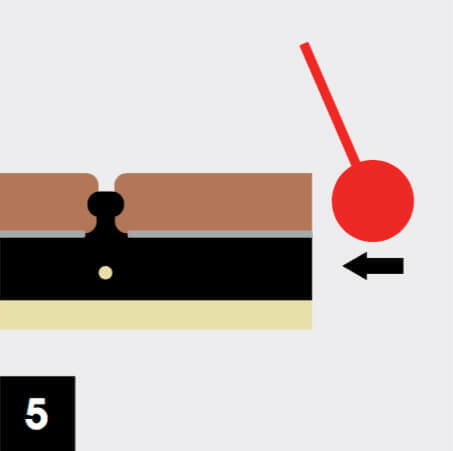 (Round bead 8-10mm) See tips and notes on suitable adhesives. Important: Position SWIFTDECK board on an angle with edge resting inside clip and then snap SWIFTDECK boards into the cliprail. This can be done by: hand, rubber mallet, or stepping in with foot, trying to avoid breaking the head of the clip. Longer boards need 2 people to ensure inside edge is located easily. 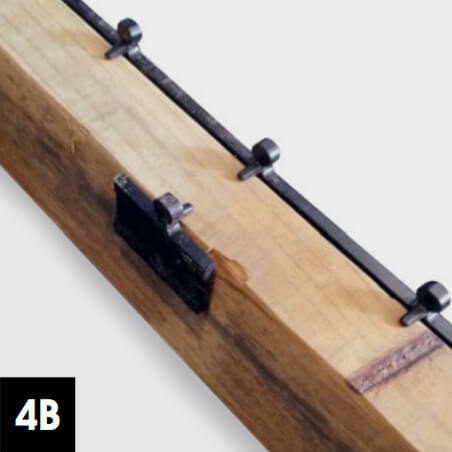 Where a join is required, dock/cut boards square. Cut a section of joist, and fix to provide double joist full width support to the decking boards. 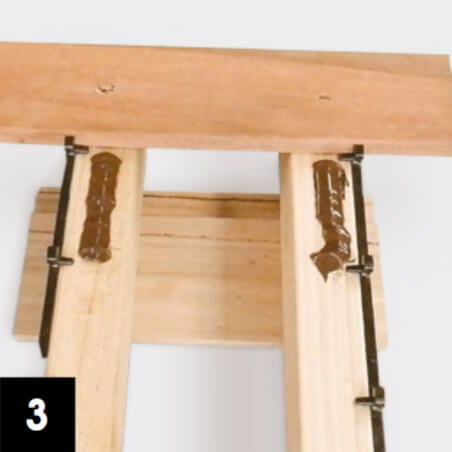 Cut a section of cliprail and fix this to the other side of the joist – boards will meet over the centre of the joist and each will be fixed by cliprail. If a lug is broken whilst installing the board, cut a small piece of SWIFTDECK cliprail with a lug on it and fix into the opposite side of the joist. This will provide position and support for existing and subsequent boards. After installing 5 boards to fill clip, knock boards on edge with rubber mallet or handle of your hammer – back towards the deck you have already laid. This will assist settling any boards that are not sitting exactly within the clips. Walk along installed boards to ensure they are well bedded in. Make sure the entire perimeter of the deck is secured. 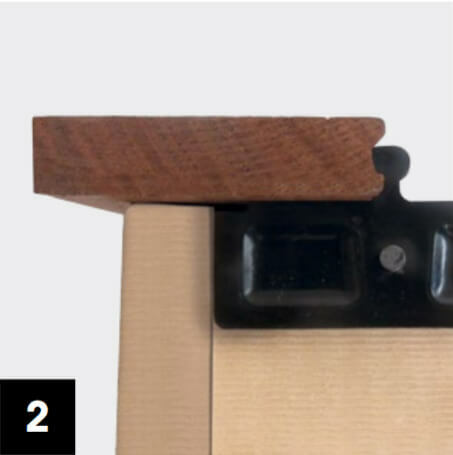 This can be done securing by screw into the groove on the edge, or achieved by fixing the SWIFTDECK Edge board conventionally (clip groove on only one side of board). Do not use silicone or hard setting construction adhesives. They are too brittle to accommodate long term timber movement and may not stick to all SWIFTDECK components. 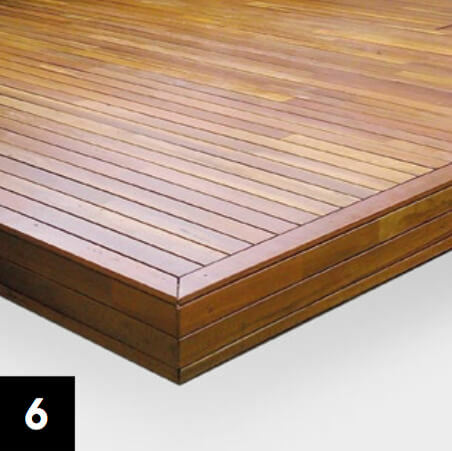 Attach only enough cliprail to joists to accommodate 5-10 pieces of decking each time (i.e. 1-2 clips) and ensuring boards are fully pushed down. Doing this automatically makes any slight adjustments needed easier and reduces the risk of the adhesive prematurely curing. 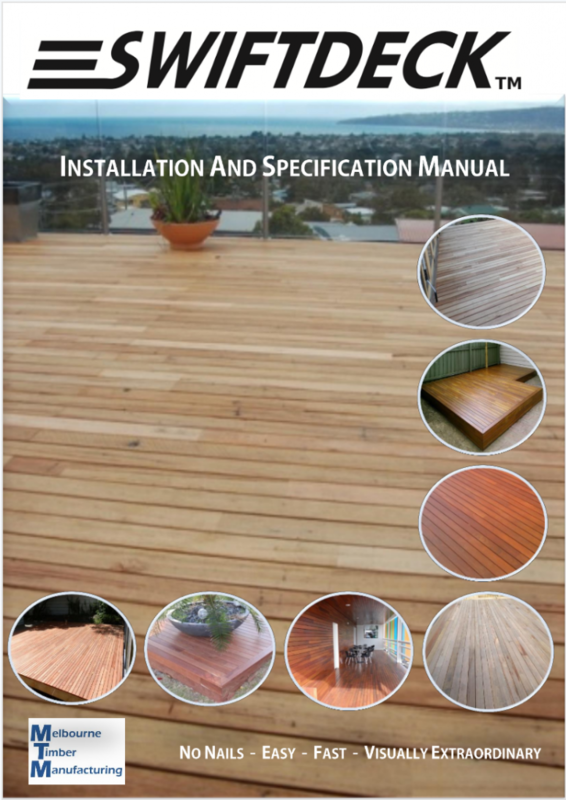 On wide decks it is recommended to check measure/plumb to ensure correct line is maintained. Lugs on Swift Deck clips are designed to flex enough to allow board placement, and will do so easily when leading edge is located into clip on an angle as shown. Occasionally clips are broken when boards are not angled correctly prior to snapping in. Fixing a small piece of cliprail to the opposite side of the joist and the polyurethane adhesive will assure no issues arise from the odd broken lugs. See figure 4B. If cutting boards, it is preferable to span at least 3 joists. Additional secret fixings may be required on small sections, particularly when cutting in around pipework, steps, etc. Ensure joists are clean. Adhesive will not perform on dirty joists, it needs a clean surface free of dirt/oils/etc. Primer may be needed for some porous timbers. See relevant adhesive manufacturer’s directions for more information regarding preparation.